Yoko Nagato (永門洋子) is a certified nurse-midwife practicing at Japanese Women’s Center, a general OB-GYN clinic for Japanese and other women in Teaneck, New Jersey. 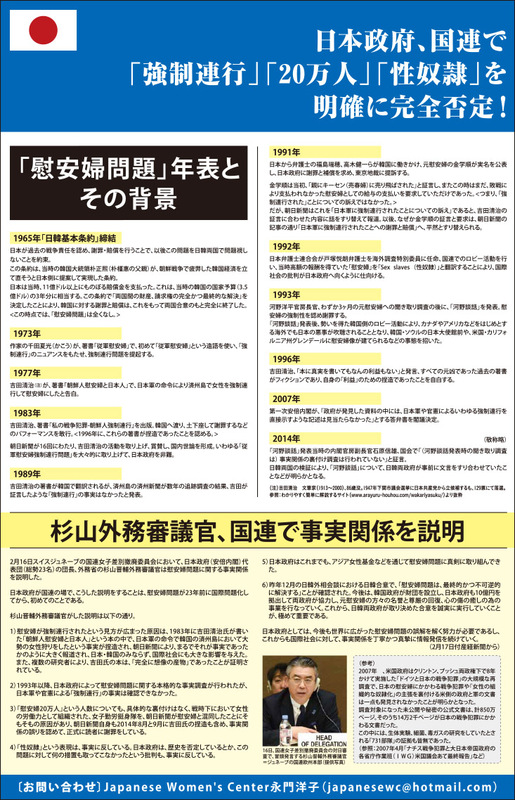 Since 2015, Nagato collaborated with Nadeshiko Action to use Japanese Women’s Center as a vehicle to promote comfort women denial, publishing revisionist ads in Japanese language publications in New York/New Jersey area. In 2016, Nagato founded Himawari Japan, a nationalist group for Japanese women in the area. Members of the group met with Mio Sugita and Yoshi Taguchi in June 2016, which led to the first Himawari Japan lecture on August 23, 2016 featuring Sugita, Shiro Takahashi, Yasuhiro Takasaki, and Shinichi Tokunaga. Yoshi (Yoshiaki) Taguchi (田口義明) is a former San Francisco director and current New York director of Happy Science. Taguchi has organized followers of Happy Science in California and New Jersey/New York to mobilize against comfort women memorials. His past involvement includes: securing venues for comfort women denier events such as the Nadeshiko Action/Happy Science Events in California (2014), facilitating online petitions against comfort women orthodoxy, organizing members to attend hearings about comfort women, and speaking at such hearings himself. During the 2016 U.S. Presidential Campaign, Taguchi brought Happy Science followers (who are also Himawari Japan members) to volunteer at the Donald Trump campaign headquarters in the Trump Tower. Happy Science openly supported Trump, calling him a reincarnation of George Washington. Yoshiko Matsuura (松浦芳子) is a right-wing member of the Suginami Ward (Tokyo) Council and a comfort women denier. She is one of the founders of Channel Sakura, a right-wing television production company and internet station. Matsuura founded the Association of Municipal Council Members Against Enacting Comfort Women Memorials (慰安婦像設置に抗議する全国地方議員の会) which has enlisted over 300 current and former ward, city, and prefectural legislators from across Japan. In January 2014 The group sent a delegation to Glendale, California to protest a memorial built in the city’s Central Park the previous summer. 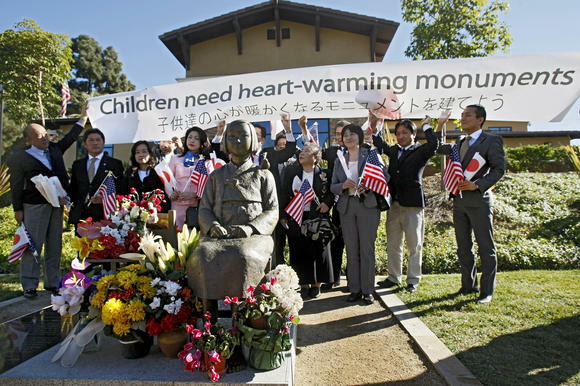 Matsuura and her colleagues held a banner stating “Children need heart-warming monuments” behind the comfort women memorial. Yoshiko Sakurai (櫻井よしこ) is a journalist and comfort women denier who runs Japan Institute for National Fundamentals, a conservative think tank with close ties to Japan Conference. Through Genron TV: Sakura Live, her internet broadcasting platform and in publications, Sakurai promotes conservative social and economic policies as well as nationalistic military and foreign affairs policies. 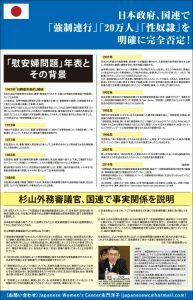 Sakurai is a member of the Committee for Historical Truth which published paid opinion advertisements in U.S. media such as The Facts (2007) and Yes, we remember the facts. (2012). She paid or offered to pay a large sum of cash to Michael Yon to give a talk at the Japan Institute for National Fundamentals and to publish comfort women denial in Western media, before her support for Yujiro Taniyama’s film, Scottsboro Girls, led Yon to publicly criticize her. Yoshiko Sakurai has no relationship to Makoto Sakurai of Zaitokukai.